Camera Sutra is an iPhone app by Belly Cubed that brings the fun and hillarity of live Photo Booth effects to your iPhone 4 using the front facing camera. I tested this out with a couple of colleagues and we we couldn’t stop laughing. LOL as you watch yourself or someone else stretch, twirl, squeeze, bump, dent and mirror in real-time. 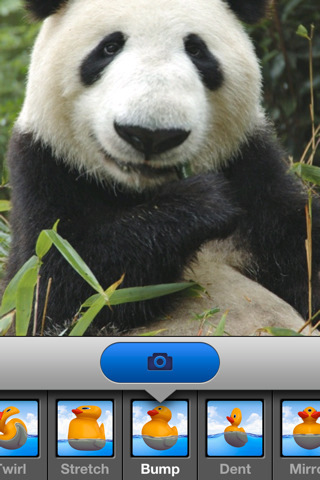 Camera Sutra also lets you take a snapshot photo of anything and it saves it to your iPhone Camera Roll. If you don’t have an iPhone 4, Camera Sutra still works on the iPhone 3GS using the back camera. But for the real fun you really should have the iPhone 4. Not all the effects in Camera Sutra are goofy. You also get a few color based filters like Sepia, Vintage and Zombie. There’s not much to do in the app besides switch effects which you do by tapping on the screen and choosing from the band of effects which slides up. You can then tap the photo icon to snap a screenshot. I have to say that the app’s demo screenshots shown in the App Store might be slightly misleading since the iPhone 4 front camera is not very high quality. It is maxed out at 640×480 which is about 1/3 of a megapixel. Therefore the photos I took with this app on the iPhone 4 are very low quality. It would be great if Camera Sutra let us switch to use the back lens as an option, which would produce much better photos. The 2 dollar price tag maybe somewhat high for casual app buyers. For what it provides Camera Sutra is a pure and simple genius, and the developer has done a wonderful job of re-creating all of the Photo Booth effects which work smoothly and flawlessly on the iPhone 4. Great app to have at a party for entertaining guests. AppSafari review of Camera Sutra was written by Joe Seifi on July 27th, 2010 and categorized under App Store, Featured, Fun, Photos. Page viewed 8549 times, 1 so far today. Need help on using these apps? Please read the Help Page.